Product code: ES3716 Categories: Sold Items, Sold Jewellery. Art Deco jewellery is stunning and here is a truly spectacular Art Deco diamond bracelet that is breathtaking. 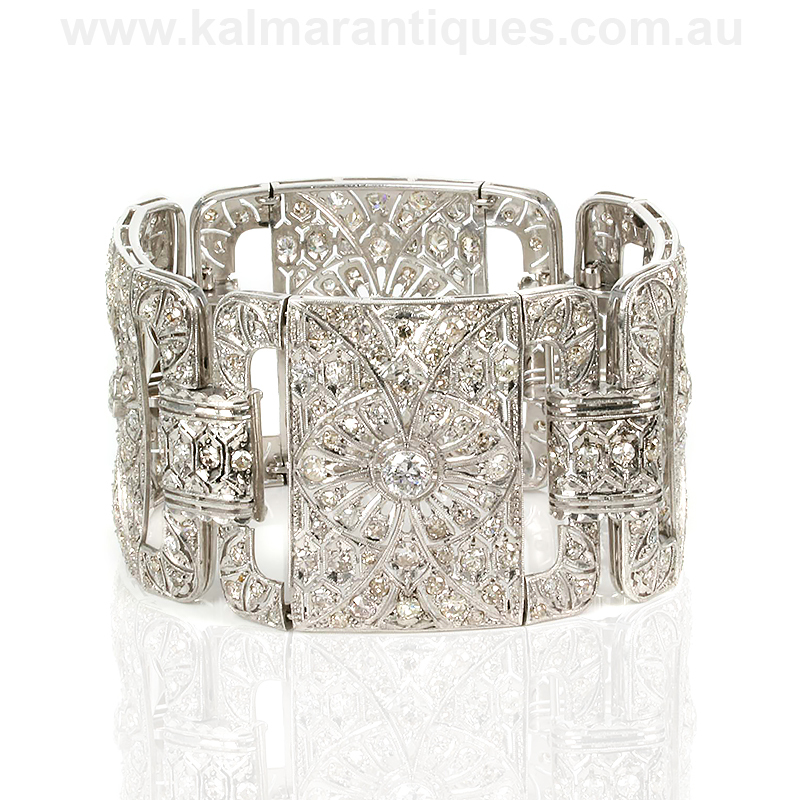 Entirely hand made in platinum in the 1920’s, this Art Deco bracelet is set with an astonishing 300 diamonds. These diamonds total 17.44 carats and sparkle magnificently day or night. The design is so typically Art Deco with the geometric design and pattern and so superbly made. Platinum was the preferred precious metal used by jewellers of this period thanks to its pure white colour and ability to be so finely saw pierced out by hand and still retain the strength needed to hold all of the diamonds. The bracelet is made up of four large panels with diamond set sections between. Even the clasp is made of a hidden design that is not only set with diamonds but once closed conceals itself. From end to end this Art Deco bracelet measures 18.4cm in length and the four large panels measure 4.2cm in length by 3.7cm wide. The width of this bracelet is amazing and the bracelet wraps so perfectly around the wrist. This Art Deco diamond bracelet would have more than likely been a specially commissioned piece and with the magnificent design combined with the 300 diamonds all go to make this a truly incredible piece of jewellery that is equally a work of art. Tag: Art Deco Diamond Bracelet.